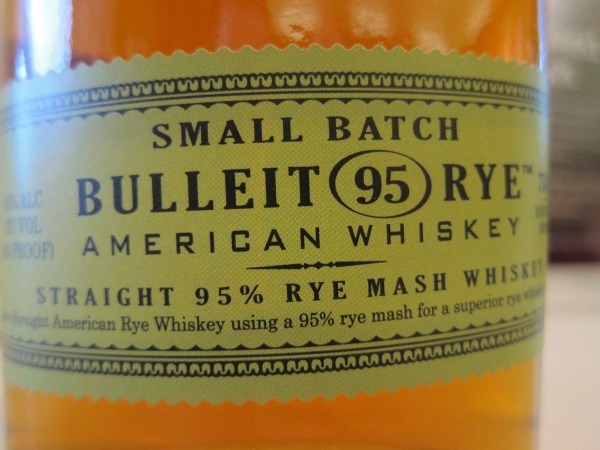 You are here: Home » Bulleit Rye: More Rye Means More Better! About 2 years ago the makers of Bulleit Bourbon came out with thier version of Rye. About six months after that I picked up a bottle of said Rye, and put it in my bunker. There it sat all lonely for these last 18 months. I guess in some respects it kind of scared me because it has SO MUCH rye in the mash bill. 95%! That is unheard of, until now. No CORN in your rye? Well, as it turns out my fears were unfounded, and I must say the makers of this fine rye whiskey have shown their true genius. Rye for me can get a sort of a dusty flavor if not made with care. Lookin’ at you Old Overholt! I even got a bit of that after taste from the outstanding Van Winkle Family Reserve Rye. It is just a kind of dusty flavor like being in a wind storm on freshly tilled piece of farm land. It must be in the mix of the corn and rye during the mash process that creates this flavor, because there was none of that here! Honestly I couldn’t really tell this was rye (being as there was none of the aforementioned flavor) it just tasted like a fantastic sipping whiskey that had great flavor with very pleasing finish. The nose on this whiskey is all honey and cherry blossom, with that floral quality coming through very pronounced in the flavor. When I took a sip, I was very surprised. It was so sweet it almost had a cordial quality to it, but then the sweetness mellowed into a caramelly and vanilla barrel flavor with a hint of char and leather. The finish on this rye can be described in one word: SMOOTH. It started with a warming sensation in my stomach, then slowly worked its way up to my chest then enveloped the entire upper half of my body. It was very pleasing, and at only 90 proof. This is a very well crafted rye whiskey. I would love to try this rye at 100 plus proof. I think it would turn the heat up a bit and make it just that much more delicious. Are you listening Bulleit guys? Maybe a barrel strength version! That would be great. This Rye was truly delicious and at about $25 for a fifth it won’t set you back too much for the privilege. I really enjoyed this rye and I think you will too. So very weird. Just got back from a quick trip with the wife to Charleston and drank my weight in Bulleit during the week. Was actually thinking about asking your opinion just the other day! Very timely. And while most all of my favorite bourbon’s are straight with an ice ball, a friend made me us a few Bulleit and Blenheim’s (a very spicy ginger ale). Perfect to cut the heat! Give it a go for the summer! Well there you go. Great minds think alike. Loved this stuff. Well worth it. As much as I like rye in almost anything else, I’ve never liked rye whiskey–probably for much the same reason that you mentioned. If I’m in a whiskey mood this winter I may just pick up a bottle of this stuff to give it a try. BTW: as I promised I ordered and tried a bomber of N.B.’s Lychee Tart. I looked, I smelled , I tasted, I smelled again and then I tasted some more. I ended up putting it somewhere in between the Duchesse (which I like) and Noble Rot (which I hate). The sensation I got was a kind of Pop-Rocks thing. If it’d been a blind taste test, I wouldn’t have called it beer, but it was drinkable. I suspect that it would be particularly refreshing on a hot summer afternoon. One more BTW: We’ll be taking our road-trip to DE tomorrow, don’t know how many breweries we’ll hit but we have tickets for DFH (we may even get to see their infamous tree house). I’m hoping to find a few more of their brews that I like. Hey Wayne, give this one a try. I think you will be pleased with its mild and sweet body, and smooth and warm finish. Very well made and much different than i was anticipating. Did you let the tart lychee warm up? When it warms up is when all the magic happens. Nope, can’t say that I did. Funny. I had the exact opposite feelings about Duchesse and the Noble Rot. I wonder how I’d like the Lychee. If you get time in DE, 16 Mile Brewery in Georgetown makes some good English-style ales. Interesting packaging as well. Haven’t been to the brewery, but their beer was something I enjoyed. If I recall correctly, you did some service time in England. Thanks Scott, traffiic was tough and temps hovered around 100F. So we only managed DFH in Milton and their restaurant/pub in Rehobeth and then had to hit the road back to MD. The tour was great though. The doyen was personable, friendly and knowledgeable (his main job is teaching English at a community college.) They’re in the process of installing the new super-sized vats so things were in a bit of a chaotic state–but very clean! No I didn’t PCS to England but I had a cupla extended TDYs there–saw a good bit of the country while making the rounds. Yorkshire was my favorite part though. My wife preferred London–she saw all the sights while I was holed up in the MOD. I love Bulleit Bourbon, so when I saw that they had come out with a rye, I bought a bottle immediately. I think it’s a great whiskey, but I purchased it to make rye cocktails, and I thought the flavor was too mellow when I used it in a mixed drink. I prefer something a little more assertive. Try Templeton Rye it’s even a step above. Absolutely agree. 100+ proof would be great. But, it’s still one of my favorite ryes. this one was among the many rye I recently tasted down in NOLA. And it was indeed a very good sipping rye. Nice post! My favorite were ridgemont reserve and sazerac rye. My absolute go-to rye. Amazing spirit and something I always have on hand. Nice review, Don. Sounds like something I’d like quite a bit. I really enjoyed the Pappy Van Winkle’s Rye. If you’re liking this a bit better, sounds like a winner to me. Duly noted. I’ll have to pick up a bottle and try it out. Nice price point, too!